The chemical composition of Sirius Gems is SiC (Silicon Carbide), commonly referred to as moissanite. The Sirius gems we produce are created using only the finest quality lab-grown 4H polytypes, all E-F colour and VVS clarity. Never heard of moissanite? Let us give you a few basics then. Did you know that moissanite can be found in nature here on earth? Or that it’s been found inside meteorites? While moissanite is present both here on earth and in meteorites, it’s only ever been found in incredibly small quantities, all the moissanite found so far is just enough to produce a single pair of earrings. 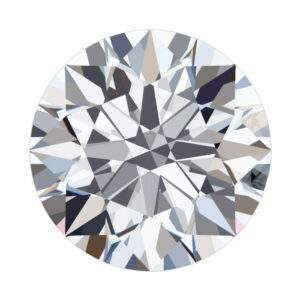 M oissanite occurs naturally in space, forming as stardust around big stars. Here on Earth, moissanite is found in crystal form, but the tiny crystals are incredibly rare, much rarer than diamond..
First publicly presented in 1998, moissanite was widely considered to be diamond by many in the gem industry who examined it. Similar to a diamond, the Sirius gems are incredibly high-quality synthetic gems with a bright and dazzling future in the industry. Sirius gems are not a copy of or substitute for diamonds, instead, they are a unique brilliance with sparkles more dazzling than a diamond. The wonderful combination of art, science and imagination have allowed moissanite to become available in the market. The Sirius gem comes with a certificate or product card stating it’s actual weight and diamond-equivalent weight in ct.
Each breathtaking Sirius gem has a clarity rating of VVS, the second best possible for any gem. The E-F colours of the Sirius gems showcase the premium quality, with only a fraction of natural diamonds able to reach the same clarity. Besides its beauty, the cost is one of Sirius gem’s ultimate selling points. For fraction of the price of a diamond, and up to 60% cheaper than other synthetic gems, the Sirius gem gives you better quality for a much lower price. The cut makes the gem truly brilliant, adding character and flare. 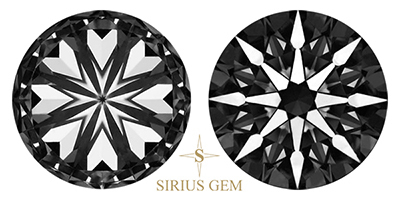 We are dedicated to focusing our efforts on ensuring the best quality cuts for your Sirius gems. A world away from the conflicts of diamonds, the Sirius gem is an environmentally-friendly alternative gem. It’s not just the Sirius gem that makes your experience with us so unforgettable; our customer service team is fully dedicated to ensuring you have the best possible experience, aiming to exceed all your expectations every step of the way. The cuts used on the Sirius gems are designed to allow the gem to reach the full potential of its beauty, maximising shine, brilliance and beauty. 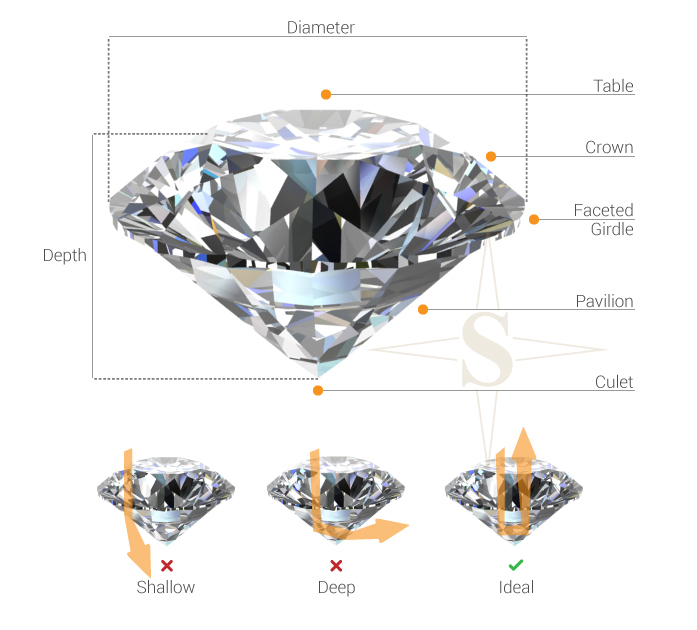 Optimised to the SiC refraction index, the Sirius cuts differ slightly to the cuts of natural diamonds. Working with skilled, experienced gem cutters, we transform the raw SiC material into breathtaking individual gems, each one cut with care and passion. With no girdle engravings or laser inscriptions, the Sirius gems are untainted beauties filled with fire and faceted precisely in order to maximise its neverending beauty. 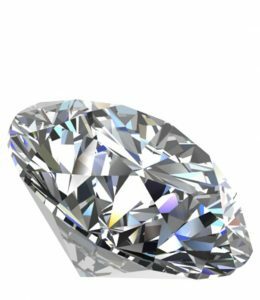 The round cut is a timelessly elegant gem cut, popular all throughout the world and a popular prime cut with our own customers. Mastered to perfection from years of experience, the round cuts are designed to show the true fire, sparkle and brilliance of each gem. Visit our e-shop to find out more about the sizes we offer and choose your dream gem. Each Sirius gem over 4.5mm with a round cut features a faceted girdle and the hearts and arrows pattern, making the gem stand out amongst the crowd. Please don’t hesitate to contact us with any cut requests and we will get right back to you with a price. 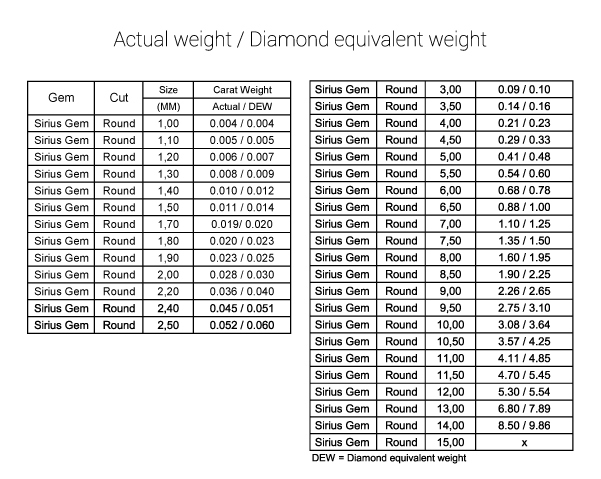 The Sirius gem weighs about 12% less than a diamond of the same size, you can find both the actual weight and the weight as a diamond in your product certificate, as well as other useful information such as the colour, clarity, cut and size dimensions. 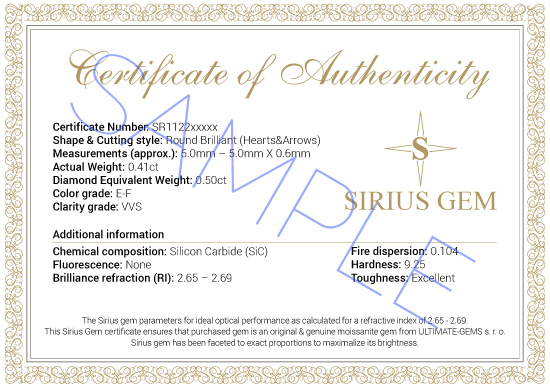 Each Sirius gem comes to you with its own certificate, where you can find useful gem properties like measurements/ct. weight, color, clarity and other information. Please note that Sirius depends on its size and every gem has the same properties as each batch is cutted from the same type of grown crystal. That is also why we can guarantee Sirius gem extraordinary quality. Each of our beautiful Sirius gems come with a lifetime warranty against losing their lustre, assuring you that your new gem will continue to sparkle for generations to come. In order to maximise its sparkle, don’t forget to clean your gem regularly. The Sirius gem warranty does not cover damage, breakages, scratches, loss or theft and the gem should be handled with care to ensure no damage comes to it. The Sirius gem is similar to work with as sapphire is, with a heat resistance above that of a natural diamond at 2000 degrees F, ensuring that a skilled goldsmith or jeweller can set your stone for you.